The Woodburn Tulip Festival is in full swing again and it’s not the same one that I remember from just a few years back. I’ve been visiting here for the past several years and I used to go 2-3 times a year in order to get the best tulip shots. However, now it’s become such an overcrowded spectacle you would have a better time driving through Los Angeles traffic then run the course in Woodburn. I was very surprised that they had far less acreage of tulips than in the past but even more surprised to see a full on theme park going on near the main buildings. There must have been a dozen booths and over 25 rides for the kids. There was a lot more to do for people but it seems like the tulips are no longer the main course. They have even opened up three parking lots as well as increased the prices to park. You can’t blame the owners for seeing an opportunity to make good money since it has now become a cash cow for them. I wouldn’t be surprised if they make more money on parking fees, food and kid’s rides than they do selling their tulips. This is especially true since they didn’t have very many tulips on their farm. It was literally half the size as in the past. It also seems that they have increased the number of days that they run the festival. More days open means more money and that is a good business decision but it only increases the days of gridlock when driving through the area as well as the city of Woodburn. With all of the new people moving to the area I’m sure that the tulip festival seems like heaven on earth. Not a lot of flowers or vegetation in the southwest. I stopped counting all of the knee high white socks and sneakers. I haven’t seen that many pale tourists since Las Vegas or Disneyland. If you want to visit in order to get some good shots of the tulips, I would recommend that you go very early or towards the end of the day since it’s a mad house for most of the day. I thought that we could avoid some of the crowds, so we went at 4 pm but it was still a complete mess. All three of the parking lots were packed but at least we were able to find several spots since a lot of the visitors were leaving. We must have counted over 500 cars packed along the roads trying to leave. What really surprised me is that they no longer plant any of their tulips in the large garden along the main road. The photo that I posted was from the garden. 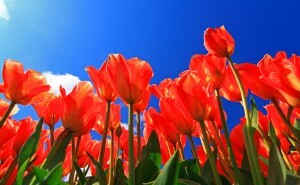 I would just lay on my stomach in the grass and get a killer shot of the tulips bunched together. I used my Canon Rebel T1I and Tokina SD 12-24mm F-4 lens. I also attached my bubble level. I positioned the camera in order to get a shot with the stems, flowers and sky. The bubble level helped me ensure that the camera was straight. This was one of the best places to visit but it seems that they no longer plant in the garden any longer. Even though it’s way too over crowded, it’s still a great place to visit and I would recommend going but If you don’t like massive crowds blindly milling about, I would stay home. April weather in Portland, Oregon! Another awesome day in Paradise! It’s currently 80 degrees and the weather couldn’t be anymore perfect. Nothing better that hanging out along the Willamette river while taking in the views of Mt. St. Helen’s and Mt. Hood. The only thing that could make it better is to be enjoying one of the many craft beers outside. The one thing that Portland has mastered is perfecting the outside seating all along the city. When the weather gets nice, it’s hard to find an establishment that isn’t offering some type of outdoor seating. With the year round tourist trade in full force and the bombardment of transplants, you can expect to see most outdoor seating at capacity. Not to mention that Portland has been named the best food city in America as well as offering the most breweries on the face of the planet. When the weather is nice, you really need to visit and take in the sights as well as the outdoor spaces available for biking, running, walking or kayaking. 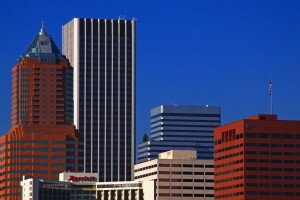 I took this shot of the Portland skyline from the east esplanade. I used my Canon Rebel T1I and attached my Canon 28-135mm lens in order to get a descent zoomed in shot of the buildings and blue sky. Some of the vegetation is still working hard to pop but the allergies are in full swing. Almost all of the cherry blossoms have inundated the Willamette Valley and if you’re allergic to pollen, I would recommend that you load up on your medicine. Gnarl Ridge from Mt. Hood, Oregon! If you’re gearing up for some great Mt. Hood hiking, this summer, I would highly recommend that you put the Gnarl Ridge hike on your list of things to do! The destination is actually just on the other side of Lamberson Butte but the Gnarl Ridge is located far below. You can also get to Cloud Cap from the same trail. The trail usually opens around late June but it really depends on how good or bad the snow season was. However, You can complete the hike if parts of the trail are still covered in snow but it can also be pretty tricky. You would also have to hike off trail and be comfortable with hiking in some steep snow covered terrain that can get pretty steep. This is on the north side of the ridge and this is the part that could be covered in snow and fairly steep towards the top. Most of the trail ascends from the southeast part of the ridge but the remaining part is on the east side and it can get pretty windy and can still have snow well into July. 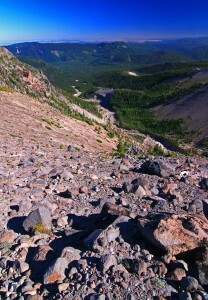 The photo posted in this blog post was taken from the back side of Lamberson Butte. The elevation is 6500 feet and the start of the hike is at an elevation of 4470 feet. This hike is pretty Difficult since it does have 2400 feet of elevation gain and the entire hike is 10.2 miles round trip. It’s also fairly strenuous and there are’t very many lulls along the hiking trail. However, this hike has it all…. Glacier access, views of the entire Oregon and parts of the Washington Cascades, foot bridges, river access as well as several small creeks that offer a great cooling off spot. You will also want to pack some mosquito repellent and lots of snacks and water. It can get pretty hot on the east side of the mountain but most of the trail is covered by the trees. There are also abundant wildlife and dozens of wildflowers to photograph. I took this shot with my Canon Rebel T1I.